This is an yummy cookie which melts in the mouth. It tastes just like the south Indian porikadalai maavu laddu. The procedure and ingredients are completely different and it is a baked cookie. As this is the first time I am preparing these cookies, I was a bit tensed. But it is very easy to prepare. We liked it a lot. I saw this recipe here. I am sending this as an entry to A.W.E.D Iranian Cuisine by Sweet artichoke started by Chef In You. I didn’t use the pistas. But you can use it for garnish. 1. Roast the flour till it slightly changes color. Keep it aside and let it cool. Be careful, because besan burns quick. 3. Add sugar, cardamom powder, rose water to oil and beat till white and fluffy. 4. Add the flour and bring every thing together. The dough resembled pie dough. Wrap the dough in a plastic wrap and refrigerate for an hour. 5. On the counter roll out the dough into a rectangle. The dough is crumby, so it is little hard to roll it. 6. Cut out cookies with clover biscuit cutter. Remove the cut cookies from the counter using a knife and carefully shift them to a foil lined tray. 7. Preheat oven to 150C. 8. Bake till the cookies become slightly brown. 9. Remove from oven and let it cool on tray for 5 minutes. Then transfer to a wire rack. 10. After it is completely cool, store in air tight container. 11. Enjoy with a cup of coffee or tea. The ingredients look quite different..using besan is somewat interesting. Have never baked with besan. This cookies sound like a baked version of an Indian sweet. Nice cookies and lovely pics. Cookies looks damn pretty and yummy..
wow looks superb!..does these taste much like the apf wise?..will have to try sometime.. 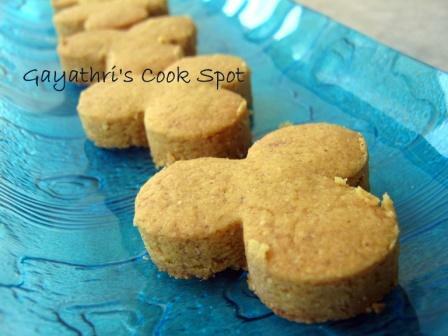 Cookies with chickpea flour!! You really are a very creative and a perfect baker. Love all the baked goodies I see here. Simply awesome baking. Looks soooo good & sounds delicious! Will give it a try! Thanks! cookies looks yummy n sound new..
thanx for visiting my blog and leaving comments…keep visiting!! the cookie looks cute and delicious. 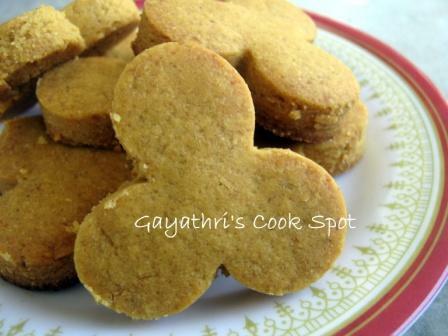 Delicious cookies with different variation..
Besan flour Cookies!!!! very new gayathri!!! Looks great!!! Bookmarked! Thanks for sharing look yummy and I am always on a look out for maida substitute.